The Chief Operating Officer of BP has just said, “This scares everybody, the fact that we can’t make this well stop flowing, the fact that we haven’t succeeded so far.” What scares me is that the COO of BP is saying this. The main issue seems to be that none of the techniques known to humankind about stopping this kind of oil leak have been tried at depths of 5,000 feet before. We don’t seem to be able to act at a distance, at this particular distance. Although perhaps it’s not so much about distance, but the nature of the medium in which we need to act, the pressure of 5,000 feet of water. After all we can send people to the Moon, operate vehicles on Mars, and send probes to the outer reaches of the solar system. But gravity, the immense pressure of the wall of water and air, and the opposing force of the gushing oil seem to have got the better of us. So it seems we have overreached ourselves in this case. In our search for more fossil fuel we were willing to take on the risk of not being able to act at these depths, if something were to go wrong. The question is, how can an organisation like BP be allowed to take these kinds of risks in the name of humankind? Is there some sort of moral hazard at work here, not unlike the case of investment bankers who know that they will always be bailed out by the taxpayer in the end? What is the worst thing that can happen to an oil company? Or to its executives? What is the ultimate limit of their liability and responsibility? What if this oil leak is impossible to mend? Would it be any consolation that BP’s shareholders and lenders lose their money and some of its executives end up in jail? That hardly seems to be a fair bargain. The philosophy of technology has a new home: the freshly launched Philosophy & Technology journal. Check out the editorial board: it has quite a few post-phenomenologists and some STS people, a few of whom have dealt with the ANT-phenomenology relation that is an interest on this blog. The range of coverage is very broad and interdisciplinary. It includes classic problems in philosophy of technology and original approaches to them, theories of technology, methods and concepts in technology, as well as theoretical topics and topics dealing with practical problems concerning the nature, the development and the implications of technologies. Particular attention is paid to new areas of philosophical interest – such as nanotechnologies, medical, genetic and biotechnologies, neurotechnologies, information and communication technologies, AI and robotics, or the philosophy of engineering – and the philosophical discussion of issues such as environmental risks, globalization, security, or biological enhancements. The journal encourages submissions on the applications of philosophy of technology to other disciplines, such as computer science, cognitive science, jurisprudence, social studies of science, and the social sciences. News of the victimisation of specific professors and students by university management is the latest turn in the sorry saga of Middlesex University. Academics can sign up here to express support for the Academic Boycott of Middlesex University. The Save Middlesex Philosophy blog has all the necessary background information on this sad case of Middlesex University mutilating itself. Not since the opening of Brent Cross Shopping Centre has our neck of North London known such heady intellectual excitement. Middlesex University, our local seat of learning, is in disarray. Students occupied one building for 12 days; the sit-in was ended only when the authorities served a High Court injunction. More than 14,000 people have signed a protest petition and 60 top international academics, including Noam Chomsky, have written angry letters. Tariq Ali has made a speech. There’s talk of barricades being manned, ramparts being stormed and Whitehall being invaded. The stroppy spirit of 1968 is in the air. This evening [20 May 2010] around 50 students and staff from half a dozen different programmes at Middlesex University’s School of Arts and Education occupied the library at Trent Park campus. Students and academics meet at the ICA to discuss university department closures. The sit-in was sparked by plans to phase out all undergraduate and postgraduate teaching in philosophy, and all postgraduate research. During the occupation, the university said that if the protest ended it might consider the reinstatement of recruitment on part-time master’s programmes, which it had previously said would stop immediately. 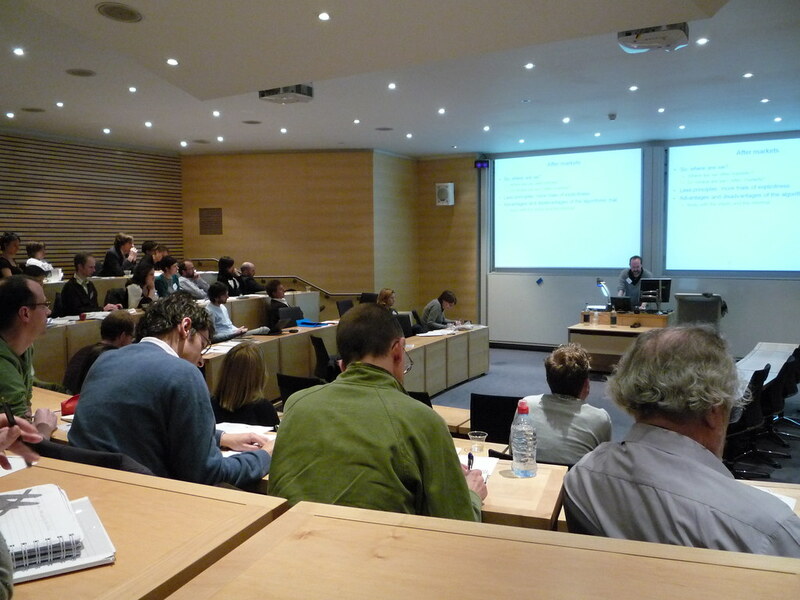 The organisers of the 23 April 2010 “After Markets: Researching Hybrid Arrangements” workshop at Saïd Business School, University of Oxford, have now posted the recordings of the event as well as a report summarising the talks. You could characterise this event as “Economic Sociology Meets Science and Technology Studies” (to borrow the subtitle of Pinch and Swedberg’s Living in a Material World book, some of whose contributors were also present), although there were plenty of people there from the wider reaches of sociology and anthropology, as well as business school academics. See photos here. This event followed in the now well-established tradition of stimulating inter- or cross-disciplinary encounters organised by the Oxford STS group (see e.g. Scalography, A Turn to Ontology, and the Does STS Mean Business workshops). If you want to get to grips with this event, I suggest you start with reading the Provocation Piece [PDF] first, then read the Report [PDF], and then listen to the talks. I found particularly interesting Will Davies’ talk, who used the example of the change of the UK “sick note” form to a “fit note” to illustrate how the boundaries between the “economic” and the “social” get reconstituted; Fabian Muniesa’s talk on how marketplaces can be described in terms of “trials of explicitness”, drawing on Sloterdijk, Deleuze and ANT; Emmanuel Didier’s talk on the mechanics of how assemblages decompose, suggesting that the STS tradition in its focus on innovation neglected the issue of decay; and Linsey McGoey and Noortje Marres’ paper in which – similarly to Didier – they focused on “experimental failure,” presenting a typology of the ways in which experiments can fail. Download and listen to recordings of the symposium presentations in MP3 format. Each file includes the talk and the discussion/Q&A that followed it. Why is Middlesex University philosophy department closing? The past three weeks have seen an international outcry at the decision by the administration of Middlesex University in London to close its small but very highly regarded philosophy programme. Why were so many American academics, many of them besieged by budget crises at their own universities, so upset at this decision made so far away? Why did Middlesex matter to those thousands who so quickly became involved, and why should it matter to all American academics, even those who are only just now hearing of it? Mutable Matter has a summary of yesterday’s “Beyond the Academy – Research as Exhibition” event at the Tate. Earlier today the BBC World Service beamed news of the closure of the Middlesex philosophy department – and the protest it has attracted – to the four corners of the world. Listen to the coverage here (starts at 41 min. 12 sec.). The situation is extraordinary by any rational, let alone scholarly, accounting. The Centre for Research in Modern European Philosophy was the feather in the cap of that young university. It was its highest-rated submission in the last research assessment exercise and in the top third of philosophy departments in the whole of the UK. Plans to shut one of the world’s leading university philosophy courses have sparked outrage among academics. You are currently browsing the ANTHEM blog archives for May, 2010.